…but more importantly, the name of our 7th and final yarn tone! Born into poverty, with an activist mother in the civil rights movement, Viola knew the struggle of class, wealth and race. Much of her arts training came from state funded programmes. But despite her poor upbringing, she managed to reach her dream and is now an actress and producer of some amazing films that tell of histories otherwise unknown. Her knowledge of growing up in poverty and learning through government funded schemes led her to be an activist against childhood hunger and free healthcare. It seems shocking in both the US and the UK, where so many have so much, where we have laws preventing cruelty to animals and where activists will break the law to stop mistreatment of animals that we have so many children going hungry and yet I’ve still to see an activist breaking the law to feed a child. It’s part of a documentary from the 80’s about the Salvation Army. This clip shows one of the hostels I grew up in and my parents managed. Things have changed a lot since those days (thankfully), but fond memories of many of the people I grew up around. 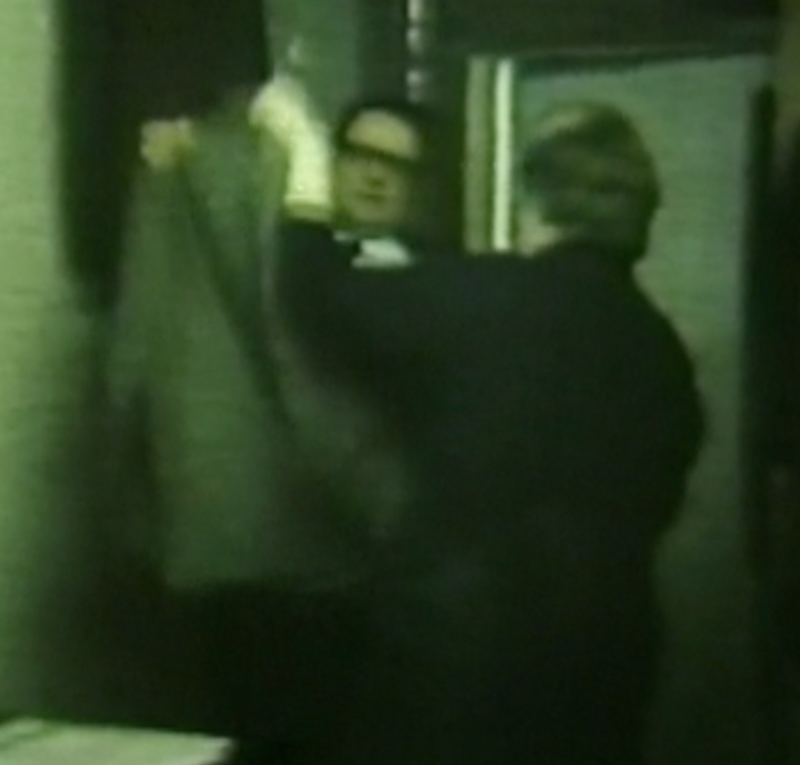 Anyway, enjoy watching my mum trying to reach the suit hanger and my dad’s stunning sideburns (I forgot about his sideburns). I’ve just come home from one of the most frustrating evenings. I’ve been in London for the launch of the Joseph Rountree Foundation strategy for solving poverty in the UK. An important event which I urge you to search the hashtag #solveukpoverty and find the video of the event. At 4pm we (20 of us) arrived for our train home to find all trains to Leeds from Kings Cross cancelled, we headed to St Pancras to catch a train to Sheffield with a plan of a further train home from there. But, so did hundreds of other rush hour commuters. I was fortunate to get a seat and slept all the way to Derby (I didn’t sleep much the night before) where we were told to get off the train and wait for the Edinburgh train which went through Leeds. We followed the advice and found ourselves crammed onto a train with no chance of a seat. Eventually, with sore feet and a sore back I got to Leeds, several hours late and beginning to feel hungry. I went to McDonald’s only to get to the counter and my purse wasn’t in the pocket it usually is, neither was it in any other pockets I checked. I stood at the counter with most of my belongings spread out in front of me and the heavy feeling of loss came over me. Thankfully some of my friends were still in the station and they had the level headedness to make me take everything out of my bag. There, right at the bottom of the main pocket – where I never normally put it, was the tiny thing I call a purse. I remembered that my student travel card had run out and I headed to the ticket office to renew it for tomorrow, only to be told the pass I use was discontinued this month and I couldn’t buy my monthly ticket. I was at that point, one nerve away from destruction and I stood my ground, rather I stood at the counter and refused to move until my discontinued pass was issued. It was a hairy ten minutes, but eventually they relented and a pass was bought. Now, desperate for a sit down and food I staggered to the counter at McDonalds and tried a second time to place an order. It was about half way through my meal that I noticed a man sitting at the table next to me, I say man, but really I’d put his age around 20. A young lad. He wasn’t sat exactly at the table, more beside it, hunched over. In his hands was a small burger, no chips, no coke. He was eating as though this was the first meal in days. I’ve been around homeless people most of my life, but not in a long time have I seen someone who’s clothes were covered in that much dirt, his face was so caked in street life that the only expression I saw was despair. It was at this point I remembered why my purse was in the pocket it was. I’d bought a bottle of Coke and a bag of mints in London and in a bit of a rush I’d just thrown everything in the bag. I took out the drink and mints and put them beside him, “something for later” I told him. A few moments later I looked up and saw a man sitting at a table with friends, he’d seen what I’d given the young lad and smiled at me. I smiled back but my heart was heavy. The JRF event I’d been to just that morning was about introducing long thought out strategies to help reduce the UK poverty epidemic. I’d sat amongst council leaders, politicians, financial advisors and charity leaders. We heard about the poverty in families, how a child born in a poor area on average will die nine years before a child born in a wealthy area. The never ending poverty caused by zero hour contracts and low pay employment that will see many people leading a life of low wage work. Then my friend, Mary, stood and spoke about her part of Leeds and the struggle of men in HMOs (Houses of Multiple Occupancy), where the negative effects of living in a tiny room with a bed in one corner and a cooker in the other leaves many of our men (and women) unable to buy enough food for the week. And here I am, sitting next to a young lad, the government could give him more money, but his addiction to the bottle of spirits hanging out of his pocket has too much of a grip on his finances. The council could (and should) build more homes so he can have his own bathroom to keep himself clean, but I suspect he isn’t yet stable enough to regularly pay the bills. We could even find a sympathetic employer but I think he’s a long way off keeping to a timetable. He needs something else. Some will laugh at my feeble attempt of giving, others will smirk and consider it wasteful suggesting he will sell the snacks for money for alcohol. Y’know, I don’t care. Perhaps, when the alcohol has gone and the pains for more are beginning he will find a bag of mints in his pocket, most likely he won’t remember me, but perhaps he’ll think to himself, someone cared and perhaps a tiny spark will stir in his soul. Maybe, just maybe, if enough people do small, seemingly insignificant acts of kindness, the sparks will grow and he’ll find the belief that maybe, just maybe he is worth more than this. The young lad gets up and thanks me, then staggers out the door, a little while later I’m outside the train station, waiting for my taxi to arrive. I see a man walking to the station, sniggering, as he comes nearer he mutters something and looks towards the row of luggage trolleys. There on the concrete is the young lad, asleep on the cold ground, thankfully it’s not raining. Already a station staff member is on his radio and the sniggering man joins the staff member, then a third man joins in the joke that is homelessness. As my taxi pulls up I see a police officer arrive and know already this young lad faces the possibility of a night in a cell. Every so often I come back to an old photo of me, a grainy image of a girl about the age of the young lad who sat next to me. I’ve not thought of the image for a while, but I remember it now. 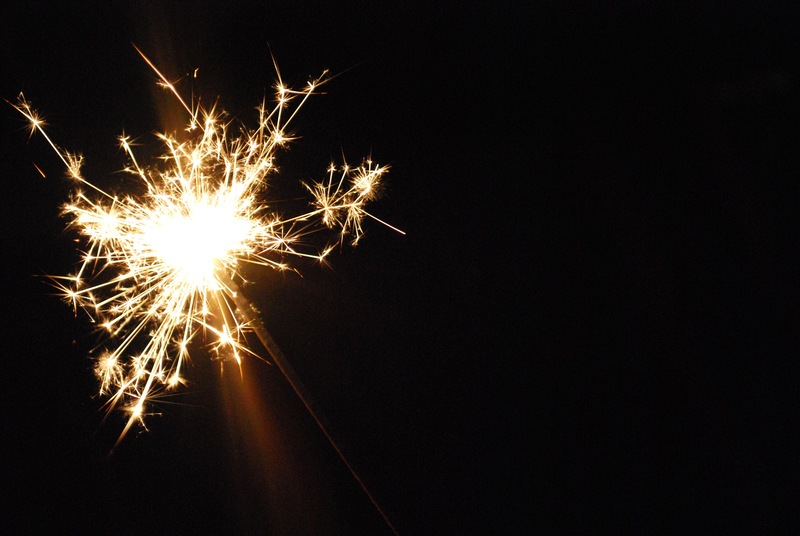 When I talk about the spark in the lads soul I speak as someone who once had no spark. I once was that young lad. Maybe I’m just so tired that emotions are getting the better of me, or maybe what is on my heart needs to be said. If I hadn’t had small acts of kindness, people who became friends despite my unfriendliness, people who never saw me as worthless, I may never have made it this far. We will always have people who snigger, people who tweet about about ‘benefit wasters’, TV programmes about so called scroungers, Loud and foul mouthed celebrities wanting to stir hatred. But we must, always, have more people willing to stir the﻿ sparks of hope, and perhaps in 20 years time a man in his 40s, will be sitting in a suit in McDonalds, after a stressful and long train journey. Maybe he’ll sit down with his meal and put his briefcase beside him and look across the room and see a young lad with no spark. And maybe, just maybe, this university educated business man will remember a night twenty years earlier when some stranger showed an act of kindness with a packet of mints. Wow! That last post of mine sure got a lot of views. Thanks everyone. I put a link at the bottom of the page in case you didn’t see it. I met a bonafide Angel once, seriously! Many moons ago I decided I would go to a church that my parents didn’t go to. I had a little 50cc moped and every Sunday I drove the 25 miles down the A58 to a church in Halifax. I was driving home late one Sunday night after youth club, about 11pm. This was back in the day before we all had mobile phones, where only banks had cash machines, and two-stroke petrol was still available at the pumps of most petrol stations. Almost all of my motorbike stories start this way… So, I ran out of petrol. There I was, on one of the lonelier parts of the road, no petrol, no warm clothing, no mobile phone. How did we ever survived before mobiles, but somehow we did. Within a very short time a little red mini pulled up in front of my bike and a man in a black leather jacket and long hair got out. And without saying another word he opened his boot and took out a can of petrol, filled my moped and made sure the bike started fine. After grateful thanks, he got back in the mini and drove off with me following behind. Ahead there was a little roundabout and as I came up to it I realised, he was nowhere to be seen. You either believe that a man, just happened to be driving down the A58 at almost midnight, instead of taking the motorway, with not only the right amount of petrol, but the right type, at the exact moment I needed it. Or something supernatural occurred. Either way, I saw an angel. The Internet is filled with Angel stories, I don’t mean people seeing glowing blokes in long dresses shouting Hosanna, I mean everyday people who get a buzz from doing something in secret. Yes, you can video it, put it on YouTube, get a viral Facebook post about the great kid who gave his lunch money away, that’s all very nice… but if you REALLY want to get a buzz, do it in secret. Find some inventive way to give, without anyone knowing. I’ve told this story before, but my dad (being a Salvation Army officer and someone who grew up in the workhouse and really knew poverty) used to give presents to families at Christmas. He knew that in houses where a parent was an alcoholic or the family were desperate the toys might be sold for money before Christmas Day, so he came up with a plan. On Christmas morning, he went to each house, knowing the children had a better chance of keeping the toys if he saw them opening them. He also knew the shame of poverty, so he had a story. He pretended that Santa, being old, had somehow messed up. The presents meant for the children had accidentally been delivered to his house and he thought he’d best bring them straight round. Of course, the parents knew the Salvation Army had given them the gift (I don’t think they knew they were on a list for donations – that too was a secret list he got the local headmaster to help him write) The children thought Santa was just a bit forgetful. Most importantly, the children didn’t feel their parents were in poverty. I have a real bug-bear about driving with empty car seats. I don’t have a car, but sometimes my mum will let me use hers. I make a point of asking people if they need a lift, because, well, it’s like this… It’s something I can do. Seek out people who don’t have their own transport and ask them if they want a lift, always tell them it’s not out of their way (even if it is). When the church has an event away from the building put a list up asking for names of people who have seats and people who would like a lift. Believe me, people who need the blessing don’t always ask for it, seek them out. On your way home look at bus stops for church members waiting for the bus, or people walking home. It was one of those days when I had the luxury of a car for the day, it was also raining very hard. There was me, all alone in a people carrier, while outside the rain was pouring down. I thought to myself, If I see anyone getting soaked I will ask if they need a lift (offering lifts to strangers is not something I advise!) I saw an older lady, huddled in a doorway, soaked. Y’know that moment in church, when you hear the verse, I was naked and you clothed me. You snigger and say to God, “OK, well the next naked person I come across, I’ll give them my clothes” then you take a wrong turn and come across a nudist beach? So I pull over, open the window and ask the woman if she is heading into town and would she like a lift. She is, and she does, so in she gets. Driving towards town I start a conversation. The woman is going further than town, but says she can get a bus easier from there. She’s heading to the hospital to find out the results of a long stretch of treatment for cancer. Her daughter would have come with her, but her grandson was unwell so she is having to take this worrying journey all alone. I drive her to the hospital, very much out of my way, but God approved. I stopped the car at the entrance of the hospital and asked if she was ok going in alone, she said she was, but thanked me, called me her angel, then asked if I would pray for her. I tell you one thing, I sat in the car praying with this lady who thought she saw an angel, yet it was me who got the greater blessing. I can tell you the shame of asking for a handout, but it doesn’t come close to the real thing. If your church gives out food parcels, next Sunday go and ask for one. Don’t let on that you are doing it as a test, or it’s not real. Plan a story, wage didn’t come through, caught speeding and had a huge fine, find a story that explains why you have no money. Then ask the person who deals with the food cupboard for a food parcel. If you don’t know who that is, then ask the minister. I dare you. If you manage it, take the request as far as you can, fill in the paperwork if they use it, if they put your name in a book think about the people you know who might see your name and ask yourself how you think they will react. Use the experience to enlighten others about the shame of asking for help, that way you might come up with an easier solution. Going back to my dad and his Christmas parcels. He knew his stuff, he knew that a struggling alcoholic would be tempted to sell his kids toys, he knew that Christmas is harder for an alcoholic than perhaps other times of the year. Y’see, when he was in the house handing over the box of toys and food, he was also having a nose. Did the house smell of mould? Were they wearing clean clothes? Mentally ticking off things he could sort out. Being nosey helped him help others. During the winter months I continued to ride my moped ‘over the tops’ to church. Through thick snow, ice, sleet, rain. Sunday after Sunday off I went. One Sunday a lady came to me in church and handed me a little gift, “something she saw that I needed”. This woman was extremely wealthy, but she sat with the homeless, she was nosey and she noticed what no one else had. I drove through the cold with woollen mittens on. The gift was a pair of waterproof leather riding gloves. She didn’t need to buy them, I certainly hadn’t mentioned I needed them, but she noticed. Start taking notice of people, have deeper conversations so you know exactly what the need is. In Leeds we have a few cafes that use a pay as you feel approach. (http://therealjunkfoodproject.org) These are places where food is sourced mostly for free, then used to cook meals in a restaurant/cafe. The menus don’t have prices, instead a bucket (with a clever lid to stop people seeing what you’ve put in) sits there for those who feel they can pay. Sounds risky, but guess what, it works. When you can pay, you pay (and many people pay over the odds to help those who can’t), when you can’t pay, you don’t. There are two great things that come from this way of doing food for free. A) since no one knows who paid what, everyone is treated fairly. There is a church in Leeds that does a cheap meal on a Wednesday night. It’s very popular with the homeless, who manage to get a good, hot, homecooked meal in the evening. The church also has a choir practice which they now hold on the same evening, and yep, the church members who work in town no longer go home for their tea, then go out to church. They come for the cheap meal straight from work. Rich and poor, sitting together, in a nicely decorated room, with tables and tablecloths, a little bunch of flowers on each table. Move away from calling your meal a soup kitchen, call it a community meal, do anything to avoid making people feel like they are in line for the poorhouse. Sit with them to eat rather than create a ‘them and us’ situation. If your church is planning a retreat or holiday consider setting up a holiday fund, start as early as you can. Maybe I can’t find £200 for a holiday three months away, but putting £2 a week in the fund for a year gives me over £100. Find cheaper alternatives to the luxury hotel or private residential accommodation. Remember the pay as you feel cafe? Well, the United reform church has a wonderful hotel/residential training centre in Windermere that, well… Here’s a link to their page that explains the hotel prices. I’ll try and tell you their amazing story. They were facing a decline in visitors and were having to charge for little things to make up the money. During a staff meeting, where they were discussing a £40,000 arrears balance and what could be done to make more money. There was a suggestion that they charge 10p for cups to use the water fountain. The manager spoke up, reminding the staff that Jesus mentioned giving cups of water in His name, we shouldn’t charge for water. This stirred an idea in the managers head. The church, probably feeling they had nothing to lose, agreed to allow the manager to turn the hotel into a pay as you feel hotel, and people who could pay, paid. Within months the hotel overdraft was down to £500 and it’s still going strong. I stayed there for a conference on poverty last year and it was wonderful, and the staff treated us (most of who lived in poverty and didn’t pay a penny) as though we were VIP guests. There was no distinction between rich and poor, we were all equal. Another idea comes from a Salvation Army church in Cannock. Every Summer the Salvation Army hold week long music schools for the kids, these are quite pricey events, but the Army has a fund that can be applied for. You just have to ask your church minister or youth worker for a form. Oh, dear, that same old shameful experience of going cap in hand to ask for a handout form. One of the youth workers realised the problem and decided to get enough copies of the fund forms for everyone. He sends one with every letter home to parents asking if their child wants to go. Every parent gets the letter and application form, no one feels singled out, no one has to know the fund has been applied for except the minister, everyone is treated equally. It’s a small thing, but important. One positive thing about being ‘on the dole’ is the amount of courses I can do. I love learning new stuff and my pile of achievement certificates now have their own folder. I’m qualified in a while range of stuff from Food Hygiene and First Aid, to Chocolate manicures and ear piercing. You want to have Hopi ear candling while having your shirt buttons sewn back on then I’m your gal. I have been known to talk about being a flute player and yet, going to a church that only has brass band players, but I learnt the flute while at music college studying brass and woodwind instrument repair, of course, to know whether you’ve repaired an instrument properly you need to know how to play it. Maybe I’m not so useless at a church full of brass players after all. What I’m saying is this. Some of us might not be able to put into the collection plate, but we might just have that skill your church is desperate for. All you need to do is talk to us longer than the few minutes over tea and biscuits after the service. Be nosey, ask what we like to do, we might not even be aware of our potential. If you ask what I’m studying at Uni I’ll tell you I’m doing a knitting degree. If you ask what sort of things I do at Uni, I’ll tell you how great I am at computers, how much I love using Photoshop, Illustrator and InDesign (InDesign is what would turn the drab yellow church newsletters into stunning professional magazines). I might tell you about a little idea I have in creating jobs for vulnerable women in the area, or how I love teaching crafts and am looking for a venue to start a new craft group. 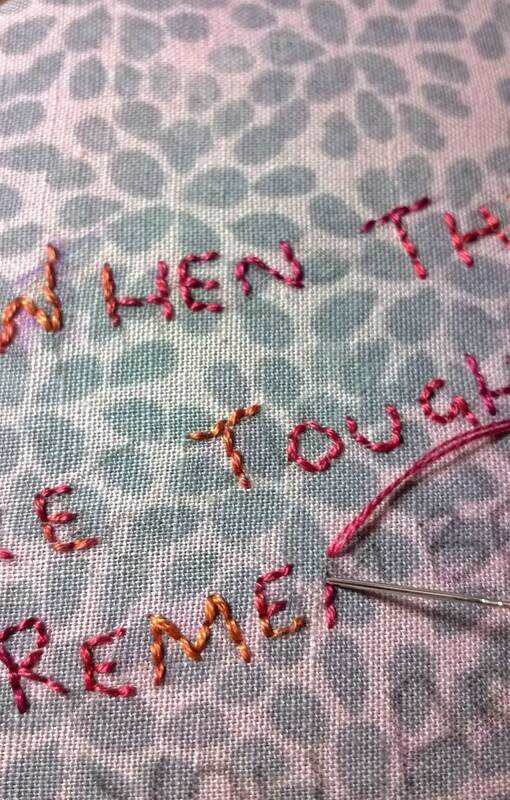 Or I might let you know about the new skill I’ve learnt in quilt making at Uni and how I’m finding a way we could bring churches together in making banners. But as of yet, I don’t think people know any of that. I’m still known as Betty who knits. I was always told that the back row in church is for the sinners, but I thought my mum told me that to make me sit near the front (so she could keep an eye on me when she was leading a meeting). Several years ago I realised, if you want to get involved in people in need, the back row is the place to begin, so that’s where I sit. You might think I sit there because I’m a rebel, our church has a back row that’s a short distance from the rest of the seats, a real back row. I sit there on purpose. If you feel ‘not good enough’, depressed, not worthy to be in a church, as if no one will want you, if you are the type of person really in need, you most likely will sit in the place where you can hide. In church that is often the back row. No one can see you on the back row, no one can look down on you or turn their noses up at you when they can’t see you. I have another seat on the row in front where I sometimes sit, but if someone comes in during the service and sits on the back row, I want to be able to move and sit next to them. Yes, I’ve had occasions when I’ve wanted to get the air freshener out (I’m also a qualified reflexologist and know how to be close to smelly feet so I can handle BO). At the moment I’m building up a friendship with a woman who brings her dog to church. It’s my own little ministry. I don’t need to wear a uniform, be ordained, get permission, be commissioned, apply for missionary funding. I sit there and knit (which also helps them relax and feel there’s no ‘airs and graces’). I have a real love for the back row people, the sinners, or perhaps the ones who are honest enough to know they can’t do it alone. The Jesus Army have a fantastic section in their church news letters called the ‘needs and givings list’ It’s my favourite part of the letter. It comes in two sections. Needs – things people want, like a toaster, a study book, baby clothes, bunk beds. Givings – I have a spare guitar, we have been given a load of flour if anyone wants some, our apple trees are ready if you want to come and pick some. Anything and everything has been put on this list over the years and with each want I think to myself, do I have one of those that I can give away? It’s a fantastic way of again allowing someone to ask for something specific, without feeling singled out as a beggar, because the whole church uses the system. SO, There it is, my list of things that can be done to help people in poverty. 1. Be an Angel, but remember secret Angels get an even bigger buzz. 2. Develop your nosey giftings, don’t just ask what they do, ask what they enjoy, how they do things, get into their lives and build deeper friendships. 3. Find ways to avoid the shame of begging, but have a go to see how deep the shame goes. 4. Realise that just because isn’t working, or working a low paid job, doesn’t mean they haven’t got a huge wealth of experience in things you just might be desperate for. 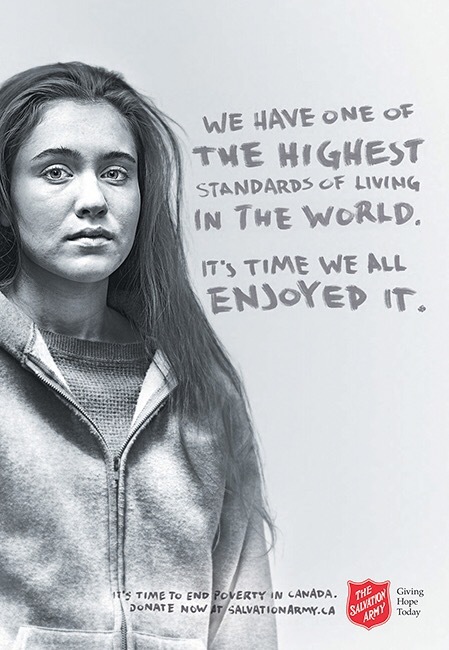 Here also is an advert by The Salvation Army in Canada, which is blooming marvellous at saying the same sort of thing. This is a post I have written for the Leeds Poverty Truth commission, which I post here for others to read and ponder. Over the past seven years I’ve gone from being hospitalised every couple months to getting a place at University. I didn’t do it alone and although it was hard work it also came about through support.Family, friends, people at poverty truth who accepted me warts an’ all, Inkwell arts (Leeds MIND) who helped me see my skills as a crafts person and helped me with my Uni interview. But just as important was my disability payments. I don’t drink, smoke, use drugs. I don’t go clubbing, haven’t had a holiday in years and am not a fashionista. I didn’t waste money as many people on benefits are accused of doing. Yes, I had a TV, and I had Internet, but my TV was a bulky second hand thing that stopped working when we went digital so yes, I had a BT box as well. The disability payments helped me fight my agoraphobia by paying for a taxi when I felt I couldn’t walk on the street. 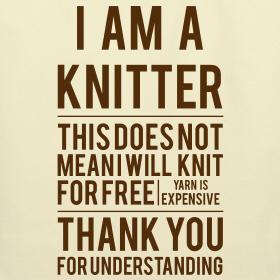 It paid for a cleaner once a month who helped me keep my flat in order, It gave me enough money to attend the weekly knitting group, which in turn gave me confidence to start a regular knitting group of my own. Most importantly it gave me my life back. Sometime in November I received a letter from the benefits office informing me that I needed to change from DLA (Disability Living Allowance) to PIP (Personal Independence Payment). An assessor arranged to visit my home and assess me to see whether I qualified. Apart from the paranoia, voices, agoraphobia and all the other symptoms with my diagnosis I have an additional difficulty – I’m Articulate. You might not see it as a problem, but mixed with a mental illness it can be a nightmare. You see, many people associate mental capability with the loss of speech. My ability to string a sentence together doesn’t affect whether I feel able to open my front door or curtains and get myself to the bus stop. However, as many articulate people with a mental health diagnosis will tell you, it can be your downfall. And I think that’s what happened to my PIP application. As the rejection letter stated, I was able to communicate. 0 points. Forget that the assessor saw how I lived in a flat that could be on a Hoarders TV show. Forget that I am afraid of opening mail, or I forget my medication, or in times of extreme stress I can forget where I am and wander off. Forget that I haven’t opened my curtains in over six months because I don’t like the thought of people being able to see me. Forget that I have difficulty with basic living skills. Because I can talk about it, I can do it. I needed 7 points to qualify, I got 6. What began next was an immediate downfall and relapse of years of hard work. Eight months later it’s almost over, but I wanted to share what it was like, those eight months trying to survive on the basic benefit of £106 a week. Mentally I thought my world had ended and started to think about how I would survive, I considered leaving my flat and living on the streets where my bills wouldn’t be so many. I even considered prostitution, seriously considered prostitution. I volunteered for a charity that worked with street prostitutes, but overnight I went from valued volunteer to client. Even though I didn’t return to the streets, there was a shift of connection between me and the other staff/volunteers. Even if they didn’t knowingly change, the change in who I was to them had changed. After the initial shock came a long period of cutting back. I had to get rid of my cleaner, my visits to the knitting group disappeared because it was held in a pub and I couldn’t afford to eat there, couldn’t even afford a Diet Coke. I couldn’t afford a taxi in emergency, so I spent more time indoors which saw a return to my agoraphobia. The benefit I am entitled to doesn’t include free prescriptions and my GP wouldn’t trust me with more than a fortnights worth of medication, so I cut down my medication, cutting each tablet in half. Half of the medication led to me being more emotionally unstable and I began crying at every difficult situation. When I could manage to be practical I began cutting back on bills, my TV was the first thing to go, but I need the Internet, I have a dream of running my own business and the Internet was needed for study, but the Internet needs a landline to work so I also need a phone. The phone is also my call for help when I am unwell, my only way to ask for help when the black dog of depression makes leaving the house impossible. Because I am at University I get a grant, somehow this was a lot less than the previous year and since I’m on a textile course a lot of the grant went on materials I need for the course. My results went down and I had a few occasions where I found myself hiding in the toilets to cry. I even had to consider whether I could afford to go to University, but knowing if I quit I still had to pay off the debt was the one thing that kept me attending – I was screwed whether I stayed or quit. Food at University is expensive, so I missed meals, I tried taking sandwiches, but I have a two hour commute to uni and since I find looking after myself difficult at the best of times, getting things together enough to make a lunch everyday was virtually impossible. I remember one lesson where we had to make our own paints. We were asked to bring in organic, free range eggs. I cried in the middle of the supermarket because I had to buy eggs that I couldn’t afford knowing it was going to be turned into paint when I really needed food. The university has a hardship fund, it has to be asked for at the main reception which is manned by young students. I felt devastated having to ask someone over twenty years younger than me for a hardship fund form. The shame that at my age I couldn’t handle money. The form itself doesn’t allow you to hide the shame though as there in bold letters blazoned across the front are the words HARDSHIP FUND. Thankfully no one from my course saw what I was carrying. Filling it in was a nightmare, I had to get help. I’m not stupid, but I found the form almost impossible to complete. Despite the hours it took to complete and the pages of evidence I had to photocopy, I didn’t qualify. My grant ran out very fast, and university finished far too early, and I found myself in May, with endless days of emptiness. I start my intern year in September, but placement after placement was unpaid. One milliner wanted someone to work five days a week, no travel expenses paid, but she’ll make a sandwich for your lunch. A lot of students had given up and gone straight to their final year, it was unadvised by staff, but you can’t live on fresh air and companies seem to want free labour. I remember the first time I ran out of food. Where do you find a food bank? Thankfully I had the Internet, but if I didn’t have that I’d be totally without connection to the outside world. Another shame, having to ask for food. I was an emotional wreck as I turned up at the food bank, crying far too hard to make my needs known. I’ll never forget the Christian couple who sat me down and gave me a cup of tea, allowing me to gather what little self esteem I still had. They gave me food, some essentials and when I got home I found a small box of maltesers. I sat there with this box of chocolate, wondering why I deserved this? I can’t afford a pint of milk, so why should I have a luxury like chocolates? But the food parcel contained other things, a tin of unknown meat I smelled and decided I couldn’t face, a tin of hotdogs I didn’t know what to do with. Pasta, more pasta than I knew what to do with (Pasta is fine, but you can’t eat it on it’s own). Knowing food bank parcels are limited to three I also knew I could only get one in extreme emergencies. I’d have to be at deaths door to get another one. My local church does a three course meal every day, £3 for three courses. I was in the church one morning when a man came in and asked if he could only have the soup and main meal and pay £2. He was refused. Another annoyance was the realisation that a lot of Christian people had no idea how desperate things are for those on benefits. I knew this mans willingness to forego pudding had nothing to do with not being hungry, but the opposite. He simply didn’t have £3. I remember helping out at the messy church and being told since I was helping I could turn up early and have the meal for half price, if only they knew, even half price was out of my reach. My rent remained at £45 a week because I was a student, you can start doing the maths if you want (£106 benefit minus £45 rent, minus £10 Internet, minus £5 mobile, minus £10 gas and electricity, minus £5 prescription payments, a £5 weekly repayment of tax from a job long since lost, £5 water rates £5 for the computer design programmes I needed for my degree…) A cat that had to have flea medication stopped led to a flea bite that came infectious and an ulcerated leg still being treated on the NHS over six months later. The appeal process is hard, getting someone to help you appeal is tough enough, but getting the benefit service to give you the correct information is the worst frustration. I was warned by a benefit advice service (who simply couldn’t take on anymore clients) that ‘they’ (the benefit phone line) would try and give me the wrong information. When I phoned to make my appeal I asked several times whether I had made an appeal and had the right information, yet a few months later a follow up call informed me I hadn’t even started an appeal. The wrong information had been given me and I was past the deadline to appeal. What saved me is that I wrote the details of my initial appeal phone calls down. The appeal itself consisted of a medical form about my illness. I had a NHS mental health worker and contacted her to help me complete the form. She informed me that she wasn’t trained in filling in forms and couldn’t help. Thankfully my switch from volunteer to client at the sexworker charity filled it in for me and the long appeal process started. It also led to me realising my mental health worker wasn’t helping and we decided to part company. At some point you start to consider the cost of it all. I don’t mean life, I mean the cost of all this to the government. Yes, they stopped paying me £100 a week, but how much did it cost to get four police officers to pull me from the roof of a multi-storey car park when I felt so desperate I didn’t know what else to do? How much has it cost in emergency mental health workers? GP and nurse appointments for an ulcer? I remember feeling so faint a few weeks ago that I considered calling the emergency services, telling them I fainted and hoping they would take me to hospital and give me a meal. How much has it cost me personally, to go from the person who was getting strong enough that when I finished university I would be ready to go back to full time employment, to the person who wonders whether they will make the next week? It’s the food that bothered me the most, food and the collection plate at church. 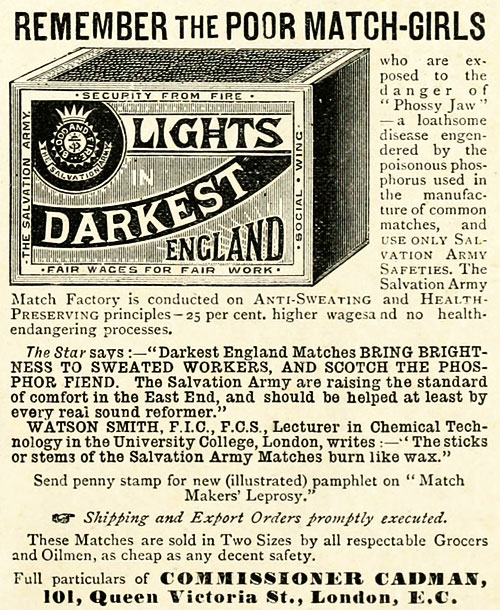 It’s the evenings when I felt light headed, or tried to believe Bovril made an evening meal (Hey, I hear it’s becoming all the rage in posh places). Going through the supermarket looking for any packet of rice or noodles that cost around 50p, that’s how much I could afford for a meal. It’s not being able to go to church because I didn’t have the taxi money and there isn’t a direct bus, knowing that there were members of the church with empty car seats, yet no thought of sharing their luxury, and it’s wanting desperately to tell them exactly why you missed a Sunday, but knowing if they consider £3 a meal as affordable then they simply wouldn’t ‘get it’. It’s the pretending to my mum that everything is fine, and the phone calls asking her if she wants to go out somewhere, knowing she might pay for a hot meal, my first in a few days. It’s the mixed blessing of finding a £20 note in your pocket that a friend has put in there as a gift. Knowing you are so lucky to have wonderful friends, yet feeling so broken that friends are feeling sorry for you. A few weeks ago my appeal went before a judge (How much has that cost?) he decided I earned 13 points. “No” I thought, “You didn’t decide, the LAW spoke out for me”. When I heard I was getting that small amount of money back (£85 a week) I cried, it’s over for now, they will assess me again in 2018. For the next two years though I have a chance to build up what confidence they couldn’t destroy, gather my self-esteem from the recycling bin and try and move forward again. Anyway now I get some money, back pay from the time my money first stopped, what am I going to do with that money? I’m going to stock my cupboard because I never again want to go without a meal to the point of fainting. The government hadn’t saved a penny in the end, but they’ve spent a fortune, in NHS, Police, legal bills, far more than if they had left me to work my way back to health. Far more than if they had accepted the word of my GP, and realised that being able to communicate isn’t a gauge for well-being. Being able to articulate what that period of difficulty has done though, might turn out to be in my favour. Starving people into work, shaming people to beg for food, cutting single people off from social activity, pushing disabled people off support before they are ready will never succeed. Imagine if the payments were raised just a little, I know many working people would be in outrage, thinking yet again that we are getting something for nothing. However, I worked for years putting into the system so that, should I get ill, I would be supported. But the truth is far from what you believe. With just a little more money, being able to provide enough food to feel emotionally healthier, being able to be socially active, to be well mentally enough to succeed as a human, that’s how it should be. If we can move away from shaming and starving people into work, and move towards supporting people to thrive enough and build confidence enough that they are desperate to give back. That will create a benefit system that works. I leave you with an image of that time, my fridge. It seems a lot of people like this blog, perhaps this post will make you smile and nod too. ‘While you do not have to be a member of The Salvation Army to attend worship meetings, or to receive practical help and support, there are two ways of making a commitment through the church. Becoming a soldier – a member of a Salvation Army church – is a voluntary personal commitment arising from a personal spiritual conviction. 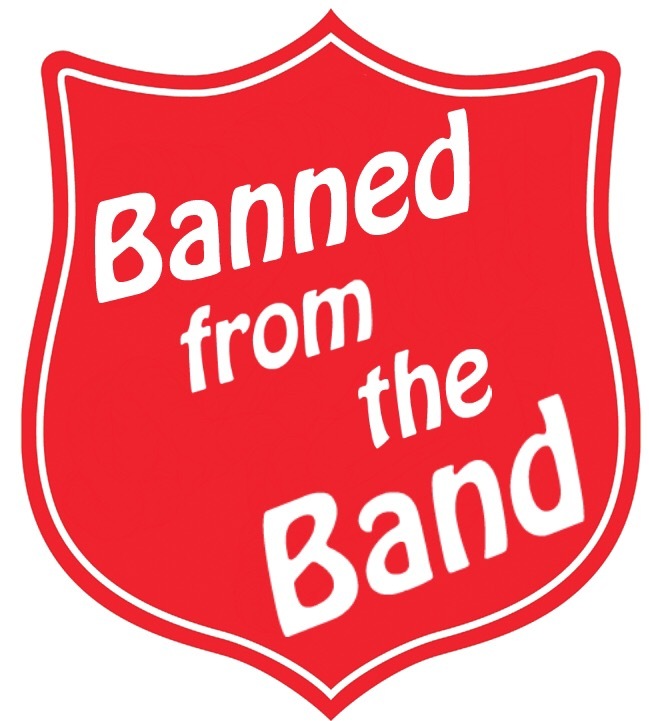 Adherent members do not wear the uniform but are committed to The Salvation Army as their church and, as such, can identify themselves as members of The Salvation Army. It is the opportunity to explore your faith and how you best express is. This afternoon I had a coffee with Bev, who attends a Salvation Army church as an Adherent. I wanted to find out what made Bev choose to be an adherent instead of a uniformed soldier (Salvationist) and whether the physical uniform played a part in her decision. Bev started coming To church as a new mother to the mum & tots group over 30 years ago and pretty much stayed. Bev is a qualified child carer and foster parent, so continued to be involved in parent & child groups and Sunday schools. Although being a part of the church now for over 30 years it was only three years ago that Bev became an ‘official’ member as an adherent. The reason was simply that she was asked. Being an adherent has made no real difference to the role she takes at church, she works hard, perhaps five days a week, helping with lunch clubs, parent & child groups, the two youth clubs, holiday clubs, Sunday school and when she has time she helps with the cleaning. She is a valuable asset to the church, yet doesn’t wear a uniform so is unable to take an official role in the church. Then again, Bev was working hard for the church long before making it official as a member. In interviewing Bev, there is a sense of frustration, of feeling unappreciated. It’s understandable that she feels frustrated about not feeling recognised for the week in, week out commitment she makes. She mentions the annoyance at special events. One occasion in particular when an important church official was visiting and suddenly a uniformed member wanted to help out with food preparation, later they were publicly thanked for their hard work at that particular event. “Some take the praise when others have done the dirty, they don’t thank the ones that do it every week, but then thank each other”. I recognise what she says, how often at big events the caterers are brought in the be thanked for their hard work, yet many of those are one time helpers, being brought in for standing ovations, when the ones who work every week hide at the back. She mentions that recently a uniformed member moved from another church and took over the job of a non-uniformed member without asking whether that was ok.
Bev speaks of “them and us”, I ask if she means uniform and non-uniform members, but she tells me it’s between the haves and the have-nots. However with the cost of the uniform being so high I wonder whether it amounts to the same thing. Bev says she simply couldn’t afford the cost of a uniform and even some of the casual items of clothing are out of her price range, wearing a uniform is out of the question. However, when volunteering at the church she wears a Salvation Army polo shirt, paid for by the church as part of her ‘work clothes’. I asked Bev, if she could afford the uniform, would you wear it? I’ve also seen this attitude to the uniform before, the sense that putting on the uniform somehow makes you a good Christian, makes you feel superior to people in the church who choose not to wear it. It’s not what the uniform was designed to do and certainly not a Christian belief. You’re either a sinner or a saint, and saints are dead people. Wearing a uniform or not wearing one doesn’t raise your status in anyway. Not wearing a uniform means Bev can’t take an official role in the church, she can’t become YPSM (in charge of caring for the young people) because she isn’t in uniform, but people don’t see the amount of youth work she does without it becoming official. I know myself, as someone who couldn’t afford a uniform. Society has left people claiming benefits with a sense of shame, TV programmes showing benefit claimants as scroungers, the government checking disabled people with the belief that we’re mostly faking it. 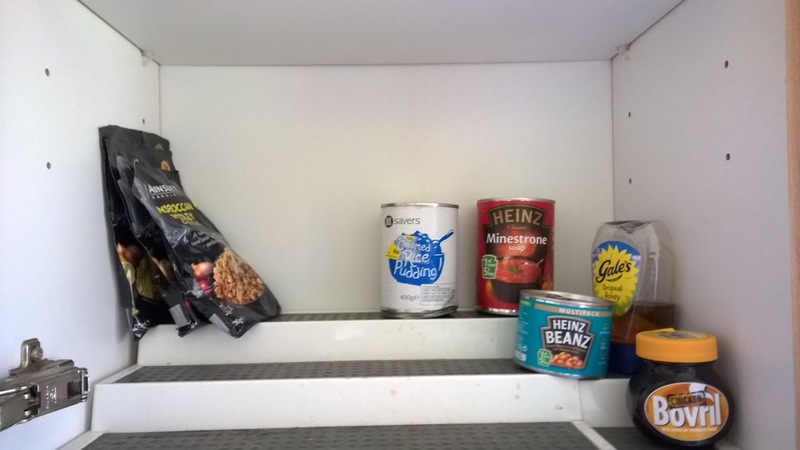 People in full time work having to use food banks rather than the government change work laws. There is a sense of shame about having to ask for something, a bigger shame than I’ve ever known about being poor. The church should be different and I know what Bev means. We should be equal in the church, a lot is said about the New Testament and it’s ‘all is one in Christ’ from Galatians 3, but they mostly are talking about male/female equality, not slave/free (rich/poor). The uniform should be something we can all afford, or nothing at all. Bev also talks about the style of it. If she wore it (around £250 for the full uniform) and saw a man on the ground in need would she feel able to kneel down and help him? Bev laughs, “not in that tight skirt.” Again I think about the parable of the Good Samaritan. I’ve heard how the uniform gets soldiers into places where they couldn’t if they were not in uniform, but they mean the few times when the Army have spoken out about political decisions. It’s not practical to help when the need arises. I asked Bev, is there one situation that you remember when you’ve been made to feel less than equal for not having a uniform. Bev tells me of a time when a uniformed member called her the washer-upper, rather than use her name. I think about this for a moment then close with two questions. It’s a shame that two membership types have created a hierarchy, which was never the plan. But I also recognise what she says, and I know, deep down, others do to. 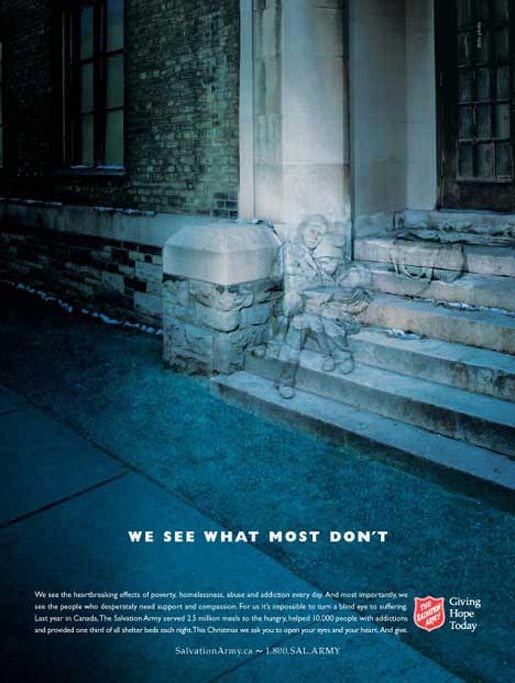 My blog usually comes with images, and I thought what would be a fitting image, perhaps an invisible man to identify with Bevs feeling of not being appreciated, but then I remembered a poster from the Salvation Army in Canada.